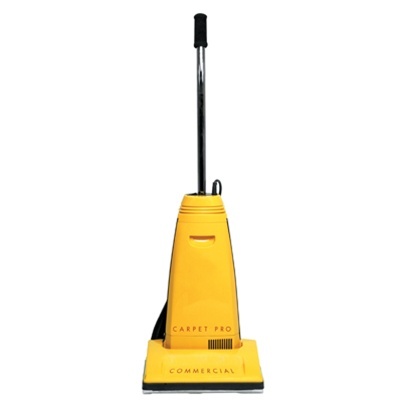 The Carpet Pro CPU-2 is a heavy duty commercial machine, built for durability and daily use with impressive features few commercial vacuums offer. Designed to last, this vacuum features a metal handle, metal bottom plate, metal brushroll, and an all metal suction motor. With the Motor-By-Pass system, all dirt is directly deposited to the bag, bypassing the motor and ensuring protection of the fan blades. Not only is the brushroll sealed off with rubber end caps, preventing hair and debris from piling up and getting stuck, but is also made using commercial-grade stiff bristles to ensure the best dirt pick-up possible. The Carpet Pro comes equipped with a thermal overload on the motor, along with a manual reset, designed to protect the motor and prevent burn out from overload. The CPU-2 is also a vacuum of convenience, including an Easy Bag Change System and a commercial grade 40-foot cord that gives the freedom to clean extensive spaces. With the Quick Cord Release you have simple, hassle-free cord removal! Lung damaging airborne particles are kept to a minimum with the Carpet Pro CPU-2's 4-stage electrostatic filtration system which captures allergens, dust, and dirt and prevents recirculation back into the air. The CPU-2's foam handle and soft furniture guard will ensure comfort for your hands while keeping your walls and furniture protected. The combined durability and convenience of the CPU-2 makes this vacuum a smart choice for any cleaning job. Also available with on-board tools for above-the-floor cleaning.